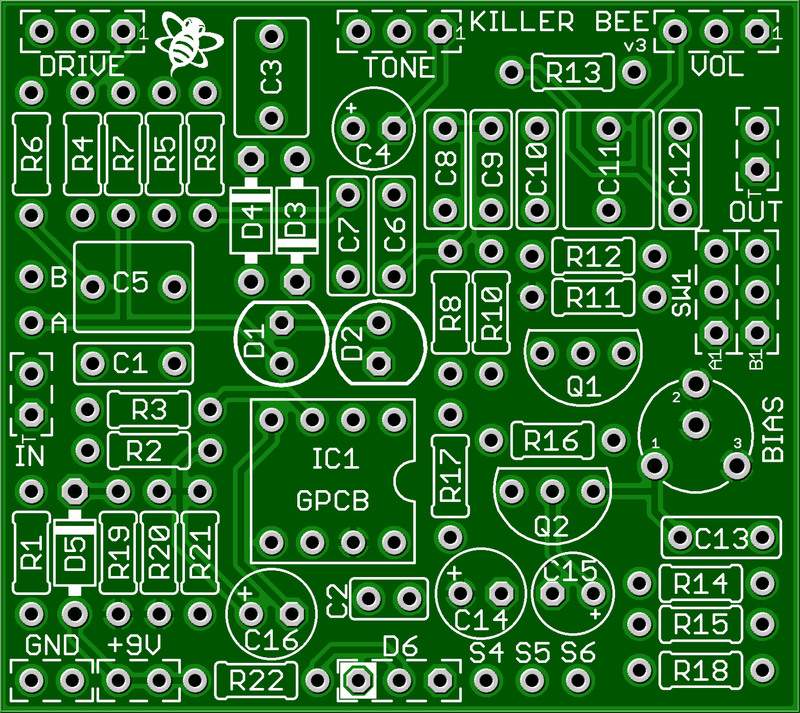 This kit includes all of the parts needed to build the GuitarPCB Killer Bee project. The Killer Bee does more than just make honey! All the sweet tone you would expect when plugged into a clean amp that cleans up with your guitar volume and amount of pick attack. Alternatively , and where this circuit shines, is for those using an already overdriven tube amp. This allows you to push your amp into a “natural sounding” distortion with articulate noise free sustain. What makes this kit “Killer” is the addition of a foot switchable boost for even more sustain and volume. Instantly add more gain and sustain under any setup than could not be achieved using a similar circuit and still have the ultimate in touch sensitive expression. This kit includes a 125B enclosure and 3 black Davies 1510-style knobs. Honey Bee™ is a trademark of BearFoot FX™. Pedal Parts and Kits is not associated with and makes no claims to these trademarks. See our FAQ for more details.